We are very proud to feature our Wonderful Web Radio Rising Star interview. In this segment, we speak with Joanne Newell. Joanne Newell, the founder of Rich Life by Design, is a compassionate, insightful and practical money-mindset coach for female business owners. To start your journey towards a healthy money mindset, register for Joanne’s free video series called ‘The 3 Foundations of an Empowered Money Mindset’, at http://www.richlifebydesign.com/. Janet: Hello and welcome everybody to Rising Stars Radio. This is Janet Beckers here, and I'm really excited to introduce to a lovely member of ours, Joanne Newell, from "Rich Life by Design." Wonderful to welcome you hear, Joanne. Joanne: Thank you very much, Janet. It's fantastic to be here. Janet: Now, I just want to acknowledge everybody that's taken the time to be here. Our intention today, Joanne and I, is to be able to give you some really actionable steps that you can go and use in your business this week. You can even use them today. That is our intention to honor the time that you're trusting us with to make it so that you can actually make some changes now. To do that, we are aiming to be able to help you in about 20 minutes, to see how much maximum value we can give you in that time. We're going to dive straight in. Joanne, would you mind sharing with us who it is that you help, and how do you do that? Joanne: I help female business owners to create a money mindset that really works for them. I found during my first coaching years that was general life coaching, a lot of women, more and more women, were coming to me with the same issue cropping up, and it was to do with money mindset, and their business. I thought, "Okay, universe. This is what I'm meant to be helping people with at this stage." That's what I do, and I help them through a beautiful VIP day, called a "Dynamic Money Mindset VIP day", and we follow that up if they choose ongoing coaching to keep their mindset going and to implement everything that we put in place, that we uncovered, and worked on, during that VIP day. That's the main work that I do with people, helping them grow their businesses that way, as well as implementing practical marketing and business strategies. I've recently, very recently, started adding a "Write That Book" service, a book publishing consultancy service for female business owners, again, because again, in listening to the universe, kept getting the signs, "This is what you're meant to help people with", and I used to be a book editor, and have written 3 books myself, so definitely know the industry and combined it with money mindset, it's hugely powerful, and it's just so rewarding for me to be able to help people in that way. Janet: Yeah. That's excellent. I love how what you're doing has evolved from you actually working with people, and listening to what it is that they wanted, and what they needed, and responding. Janet: Yeah, that's brilliant. Well, let's have a look at our connection. What programs have you done of mine that's meant that we've connected? Joanne: MeTV. That was a couple of years ago. You were at Goddess On Purpose event, and spoke on stage about how easy it was to make videos. That was very achievable, and very doable, and although I have a kind of background in presentation from a film and TV point of view, I did film and TV at high school. I did a diploma of film and video production in the early 90's, back when it was VHS, remember? Joanne: The old tape. We used to go in the editing suite over night and edit things, and also, presenting, I'm very comfortable with doing that, but I just knew that in this modern age, showing my age now, I really needed more guidance on the technical aspects and on the online marketing, and upload and things like that. When I heard you present, I just thought, "Yes, you've been doing it recently, and you've got systems in place, and you can show me what to do with that side of things." Janet: I love ... That's really nice to hear from somebody that's actually got a background to do with film, because a lot of times, because you've studied something in the past, it's very tempting for people to go, "Oh, that's all right. Look, I know this myself", and the other one is to go, "Look, I can work all this out. I don't really need to actually learn from anybody else." Joanne: That's the thing, yeah. Janet: It's actually really refreshing to hear somebody that can go, "Okay. I actually recognize that there's got to be cleverer ways for me to be able to do this." Joanne: Exactly. There is a lot of free information out there on the Internet, but it's accessing it. It's knowing who's worth listening to, it's trying to find it all. It's very time consuming, so to have everything packaged up, that's really specific, that's explained so clearly, and that's what I love about your audio's and tutorials, they're just so clear and step by step. It's like, "Oh, I don't need to find this bit and then that bit." It's all together, and that's exactly what I was after. It meant I was able to leap in when I was ready to start doing videos for the newer incarnation of my coaching business, so I felt really prepared and so glad that I invested in the training. Joanne: I think even for people who haven't got a logical mind, or they feel confined by structure, I think everybody needs some structure, and a bit of step by step, even if they rail against that from their personality point of view. It just helps guide you to where you need to get to go, and even if you adapt things, and there's things that I've taken from the course that I've then run with and found more about, and experienced myself and tweaked to suit me, but I started with that framework, and that has just served me so well. Janet: ... You're actually using your creativity on the right things. Joanne: Yes, and you're not getting lost, and you're not self sabotaging by procrastinating and putting things off because you don't know the next step, which I think can be a kind of avoidance thing. If you can't avoid it when you've got the step by step, because then you have to start taking some action, and it's all laid out for you, so it's not like there's stress involved wondering what the next step is, because it's all there. If you choose to have a break from it, and go and do something else, that's fine, but of course, if you can come back to again, and again, when you're ready for the next stage. Janet: Yeah, that's great. Tell us, what did you do? How did you then apply this in your business using the video? Joanne: Well, I watched Paul's videos about technology, the cameras to use now, because I really haven't done any of that digital recording. We had a little old digital video camera, but it wasn't anything terribly flash, and I didn't feel like my phone would give the best, or my webcam would give the best for the result that I wanted, so I went with the camera recommendation that he gave and got that revision about lighting setup, which I had learned from my early days. It was so good to hear it again. I got the equipment, and it wasn't like I spent a lot of money, but I wanted it to be enough that it would give a good enough quality for what I wanted for the types of clients that I wanted to attract, and appeal to. I would have hair and makeup done, as well. There's all those sort of things that help me prepare for when I was getting ready to do videos, and you suggest so brilliantly to do batching, when is just so efficient and effective in getting a heap done, you know? If you're going to go to the trouble of setting up the equipment, you may as well do a few in one day. I would have an afternoon, and do a few. I think my maximum was 12. I think you said you did 20 in one day. Joanne: Bowing down right now. 12 was kind of it. I think the throat was starting to ... My voice was gone by the end. It is ... You do ... I think anything, when you want to have confidence in something, it helps to be prepared so to actually plan, "Okay, these are the topics I'm going to talk about in my batch", and have bullet points. You don't need to write out every single word of the script, but just to be prepared that way gives you that bit of confidence. I think that's true in anything in life. If you can prepare for something, it gives you a bit more confidence, even though you can't prepare for everything. Janet: You know what? That is a really good tip. It sounds like an obvious one, but just to give you a little bit of an insight, you talked about batching, and the power of batching. It's interesting, you were saying that if you're going to get your lighting and your camera set up to batch, for me, it's like, "Am I going to put the makeup on?" I'm going to batch. Janet: It's an interesting insight. I've just published this week my 200th episode. Janet: Yeah. I mean, that's nearly 4 years. There's been a lot of batching, but just an interesting insight, in the last month ... Just in the last few weeks, I haven't practiced what I always do. I haven't practiced what I preach. I kind of went vague for a little bit there. It happens to everybody, and I hadn't done my big batching. For the last couple of weeks, I've done, "Oh, I've got to do 2 here", and, "I'll run off 1 here", and they've all been spontaneously, which is not the way that I would normally do this. Joanne: Your energy gets scattered. Janet: I tell you what ... Well, normally because I would have planned out my 12, and when we say plan out the 12 that you do, that's not a huge commitment, because basically, I just keep a running sheet of ideas and so a couple of times a week, I might write down something that came from a question, or from a customer, or it might be something I saw on Facebook, or even somebody else's blog post. To have the 12 ideas is ... I've usually got more, but because I hadn't done what I normally do, for various reasons, which were, they were pathetic. They're not real reasons. Normally I would be able to just shoot 12, and have to have very, very few retakes. Because of not having that sense of being prepared, and then you feel much more confident in what you're doing, I found I had to do per video, 3 or 4 retakes, which was ridiculous. Joanne: You haven't got the momentum. Janet: Yeah, and your mindset's not exactly ... You're not focused. You're not focusing your energy. It was an interesting insight for myself that what have I done these last few weeks that put me off my normal track? Really, really timely thing for you to say that because, and it's also just for people to know, if you're not doing it, it's okay. It happens even for people who have been doing it for 4 years, but it's a really important tip, so thank you sharing that one. Joanne: You're welcome. You're welcome. It's nice to know that you're human, too, Janet. Janet: I am exceptionally human, I can tell you. Joanne: Goodness. Well, it's actually funny because I went a bit off track in my last batch of videos. I just got a bit bored with saying at the end, "Make sure you share this with every entrepreneurial woman you know." I think Paul commented on a comment I left under one of your videos recently, that I hadn't said something at the end, and I should be saying to share. I just hadn't done it. You know, of course you've got to do those things, and it makes sense to, if someone's watching you, especially for the first time. I think sometimes we forget that this might be the first time someone's seen you on video, so you've got to make sure that you have that call to action in the video, and it's just something that I didn't do in a couple of the recent ones, and I thought, "Right, have to get back into doing that." Janet: ... Process for deaf people to use as their guide for how you structure your calls, and if you miss any of the steps, it does make a difference. Just stick with your system, and yeah, rinse and repeat, works in business. Rinse and repeat. Janet: Yeah. Now, you were also telling me that before we got on the call, that with your new working with people to do their books that you've also been using video now over into your cellphone. Is that right? Joanne: Yes. Well, actually, the very first videos I did were for my opt in. A 3 part video series called, "The 3 Foundations of an Empowered Money Mindset." I'd done a welcome a video, which I've now changed to be a different page, just doing some testing to see what appeals to people most. 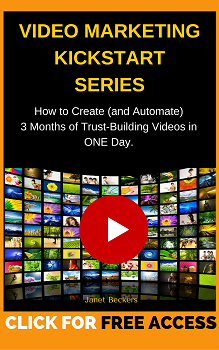 It used to be when you came to my website, unless you'd been before, you would come to the video where I welcomed you to the page, and invited you to register for the free gift of the 3 part video series. That was the first time I'd done it that wasn't a YouTube video, meant for YouTube. It was just for my site, and I've done that, also, with this "Write That Book" video. It's been good to have ... And also, I love that because it actually comes up as a better quality video, and I know YouTube, we have to compress things a bit. Even though that can be flattering, because it makes it look like you've got a soft filter on, I really like having it on the website, as well, because it really shows it up beautifully. If people wanted to have a look at that page, it's RichLifeByDesign.com/write-that-book, but if they watch the video, they'll see there's a couple of times where I flubbed it, where I said a word, and I actually meant to say something else so I quickly said the right word. I want people to know that that's okay, you don't have to be perfect. That's a sales page video, an information page, but it was still me, and I was still getting my message across. You don't need perfection. I think I've heard a quote that perfection is for poor people. If you spend your life perfecting and perfecting and video, we are showing ourselves as our most human, just be okay with it. People are very forgiving at that sort of thing, and you're still getting your message across. Janet: That is a really good tip, and you know, in fact, by having those little tiny mistakes that you make, and leaving them in, allows you to actually develop a higher level of trust with the viewer, because the viewer goes, "Oh, okay. This is actually them. It's not just them being perfect." Joanne: And, "They are okay with being them." Janet: Yes, so those little things can actually give a higher level of trust. I know sometimes when my dog barks, and then I'll just laugh at the dog barking, or a kookaburra going, and I leave those in, and I get comments from people that come through to my email saying, "Oh, I just loved that little bit. I've got a dog, and my dog's named this." Because they actually ... Yeah. That's absolutely right. Let's have a look. I'm really aware of our time, wanting to make it that we give maximum value to people. I feel like you've given some really good tips already. For people who ... What I love is for people who are listening, I'm challenging you to take some action this week, and in fact, depending on what time of the day you're listening to this, do something today. What I'd really love to hear from you, Joanne, is what some just simple tips that people can actually go this week and implement so they can start using video in their business? Joanne: Well, I think someone you said before is actually fantastic and it's what I do, as well. I'm sure other people do it, but I'd like to highlight it, is that whenever you have an idea, whenever you see a question that someone in your community has brought up, jot it down. Keep a list in a Word document or something on your computer, or on a sticky note by your desk that has a list of ideas for your next video batching shoot, because that will be really ... Then, you're not having to suddenly sit there and think up ideas on the spot when you're planning for that day. I think that's a fantastic idea, and it's something I do, as well, and it just saves so much time to do it in that moment. That's something I definitely recommend. I'd also say seek guidance, such as through Janet's course, the MeTV course, if you want that technical and presentation and marketing knowledge, rather than having to trawl, spend hours trying to sort out the dross from the good stuff, from what's free on the Internet, because you don't know. If you can, invest, I think, this is just from my point of view, in the best quality equipment you can afford at the time. You can always upgrade later, but I would try to get as good quality as you can. Something Paul really recommended is the quality of the audio, so I actually have a lovely mic, a Rode one, which is an Australian brand, I think, for mine, and I'm really happy with the quality of that. It really does make a difference and make you appear more professional for all those little tips, little things that help it come across as a professional presentation for people, even though you are being human, as well, and making mistakes accidentally and so forth, and lightning. I like flattering lightning, but that's just me. Janet: Well, no, it makes a huge difference, because I always try to shoot my videos to use natural light, and so that may mean that I might have to postpone my video creation for another week or so to be able to get the best light, because that's one of the most flattering lights you can do. Otherwise, taking that time, and it doesn't have to be expensive, like in the program, we show you how to choose lights and how to adapt them that you just get from the local hardware store. They're not expensive. Janet: It can really make a difference to where the light falls on your face, and so, you don't end up looking like you've got big bags under your eyes. Joanne: Yes, exactly. Exactly. That's something that I would definitely recommend. Getting the guidance, so that's something they can do this week, choosing from things like jotting down ideas as you come across them, to looking into investing in specific guidance on this. That's something I find people are always saying to me. "Joanne, you're such a natural speaker, and how do you do it with such confidence?" I think that's from that background that I've had, and I just think a course like yours, it gives people that, especially there's a link to a fantastic video that you put in there that people will find out about when they invest in the course for helping increase your confidence, and there's so many great ideas on that in there. If you can get it all in one thing, in one course, then you see it. Janet: Yeah. That's great. People can get free training on the MeTV course, if you just go to WonderfulWebWomen.com/MeTV, and you'll get some ... There's a webinar, and there's some free training. You can get a feel for what's involved, and get a taste and some tips there to get started. Joanne, how can people keep in contact with you? Joanne: Well, they can contact me at my website at RichLifeByDesign.com, and I'm also on Facebook, Rich Life Done By Design, Facebook page there, so come and say hello, and if you've got any questions at all about video, I get this all the time from people I run into asking me about my videos, so I'm happy to help you out with any questions you've got. Joanne: The video series, yeah. Janet: ... You might want to join, or be able to get her emails. Yeah, so come and give us ... It's really lovely to be able to get some feedback, and then Joanne and I will be able to come and leave comments for you. Janet: Anything else that you'd like to say, Joanne, before we leave? Joanne: I think I just have overall tip, and that really is, and this is the ethos behind my business as well, is to get your mindset right. If you're not prepared to go outside your comfort zone, if you haven't addressed the things that are holding you back, it's going to be hard to get started with video which means then you're not going to be as visible and not be marketing your business, and not be making the money that you want to make in your business. If you can just address, even if that's the one thing that you do today, even if it's none of those practical things about actually getting started with video, it might be just looking at, "Why would this be scaring me?" if that's how you're feeling about video, and "Why am I finding this daunting? ", and "What can I do to change that mindset so I can start taking action?" Janet: Yeah. That is a brilliant tip to end on, and so incredibly congruent from a woman whose business is helping people with mindset and to be able to step up to some entrepreneurial. Thank you so much for your time, Joanne. Thank you very much for taking action with the programs that I've put together, and being such a wonderful example of somebody who does put themselves out of their comfort zone and just get out there and does that. Thank you very much. Janet: Thank you everybody for trusting us with your time today. Go out there and get them. Go and take some action, and can't wait to hear what you've come up with. Bye.